Part of Arnold Kim's other sites, AppShopper and MacRumors, TouchArcade is one of my favorite weblogs: I read it every day. 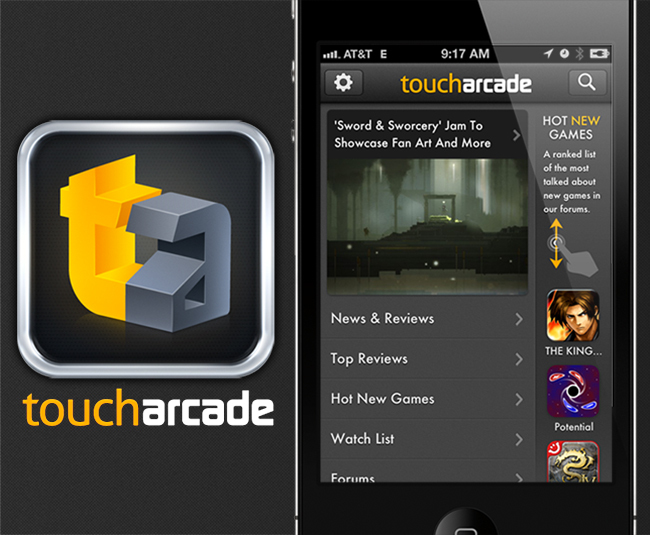 Whether I'm reading about upcoming iOS games, news, or searching the forums, TouchArcade is simply one of the best resources for iOS gaming available. They've been around for 4 years, and for a website that's a lifetime. I jumped when I was asked to help be part of the beta team for an iPhone version, and today, TouchArcade has released their very own iPhone app with the help of Flexibits and Bartelme Design. 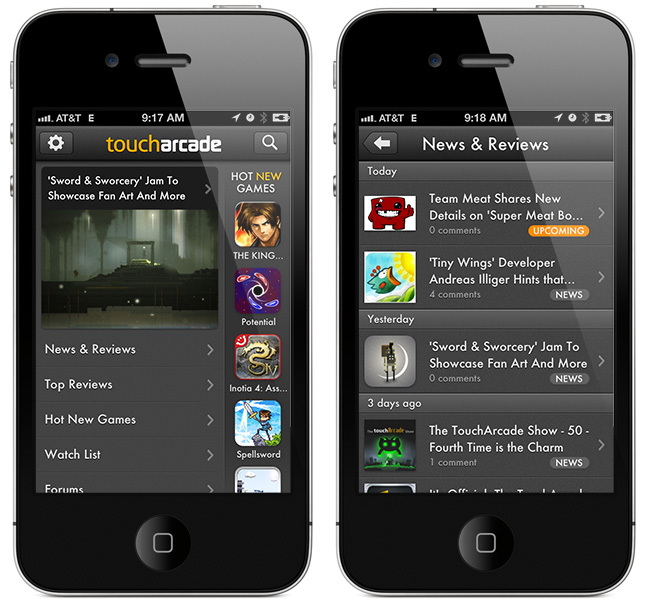 When you first launch the TouchArcade app you will see a featured story on top along with a navigation list below for News & Reviews, Top Reviews, Hot New Games, Watch List, and Forums. On the right is a flickable list of their Hot New Games section with icon previews, and this is one of my favorite features of the app. If you're looking for a great game to purchase this is the first place to look, and the list is constantly being updated too. Every section of the app looks and feels consistent throughout with shades of grey and contrasted with white type that is easily readable. Articles have colored "tags" that help the eye differentiate between the types of posts as well. The built-in push notifications will keep you up to date for featured stories, news, or updates to your watched list. Don't worry, the TouchArcade app has notification times so you don't get alerts while getting your precious sleep. News & Reviews is sorted by dates but Top Reviews and Hot New Games has advanced sorting, much like the AppShopper app -- hotness, time, genre, and price point. TouchArcade's forum board is one of the most important aspects of the site, as it gives a voice to all of its members. There is discussion for everything from device specific games to price drops, MMO codes, Mac App Store games, and general discussion. The forums have been integrated very well into the app: you can post, rate, comment -- just like the website. Application detail screens show which device a game works with, price, inline videos and screenshots (together at last! 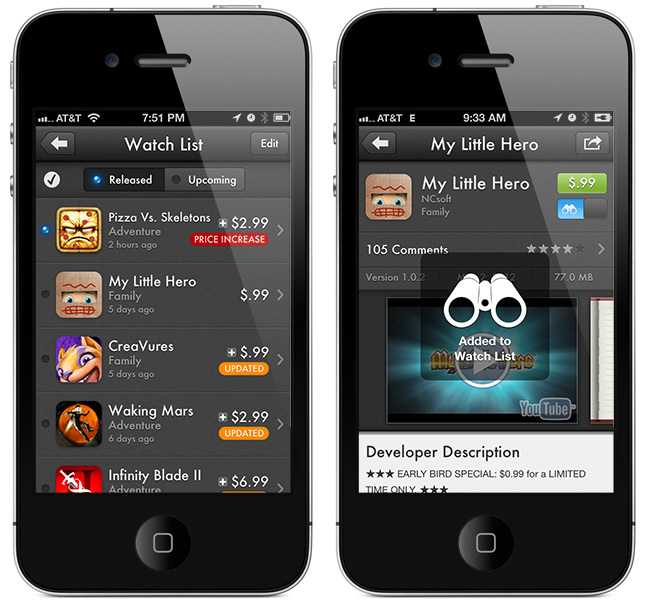 ), description, and app activity (much like AppShopper). TouchArcade's review ratings and forum comments are also shown in this screen. There is a sliding button under the price with binoculars that when activated will add any game to your watch list, so anytime the app is in the news, updated or on sale, you get a push alert and it is indicated with a blue led in the Watch List section. At the very bottom of the detail screen there is a button that links directly to the AppShopper iOS app letting you open it there as well. Detail screens can also be shared via the upper-right share button; email, copy, tweet, and many other options are there. 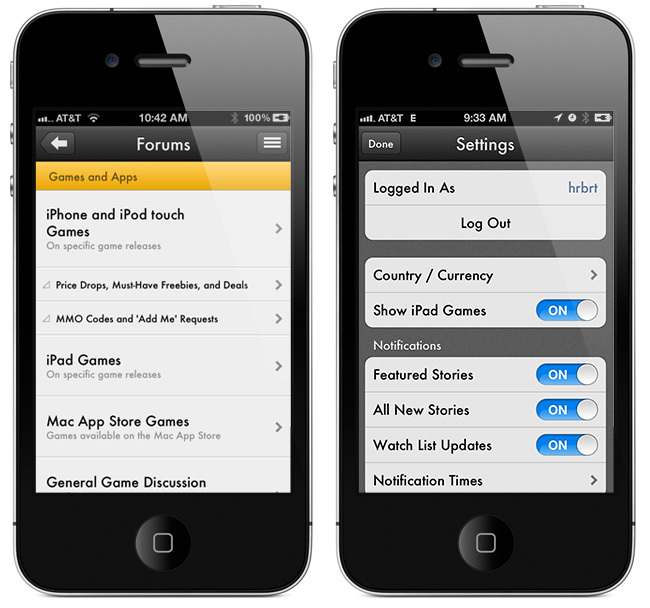 One may ask why do they need the TouchArcade app if they already have AppShopper on their iPhone? Well, this is much more than a 'discovery app': it contains news, reviews, and a huge user-based forum. The two can easily be used in tandem, as I have been doing for a while. They complement each other very well -- I use TouchArcade for discovery and opinions, AppShopper for price drops, releases, and app update information. A little secret for our readers: AppShopper for iOS is getting a major update as well, and I can't wait to see what Arnold, Eli and their team have in store for it. You can really see all the hard work that was put into the TouchArcade app. It's very fluid and has a ton of information cleverly disguised inside a clean, beautiful iOS app. The app is free and available now on the App Store.